An active student during her time on the Fayette campus, Hough was a member of Sigma Tau Delta, the Biology Club, Aonia, YWCA, WAA, and PEACOCK yearbook. After winning the campus tennis tournament her sophomore year, she was named the head women’s tennis coach during her final two years of college. UIU will be placing a brick in Emma’s memory near the School of Liberal Arts building on the Fayette campus. 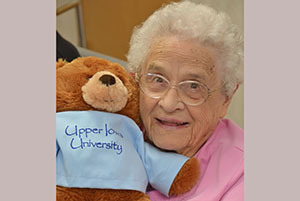 Emma was last featured on The Bridge Online in December 2015 when she celebrated her 111th birthday. The story can be read here.